When not glazed in ice and snow, a daily stroll through it takes you past employees from the surrounding businesses enjoying a lunch, the young and crunchy feeding their dogs, the town nut-jobs napping under the trees, and the electric lemon-clad bike cops keeping an eye on things. On Saturdays from 9:30AM to 2:30PM, however, the peaceful slumber is upended as the park swirls with the business of organic farmers and local restaurateurs, and the pleasure of musicians, children, and tourists. 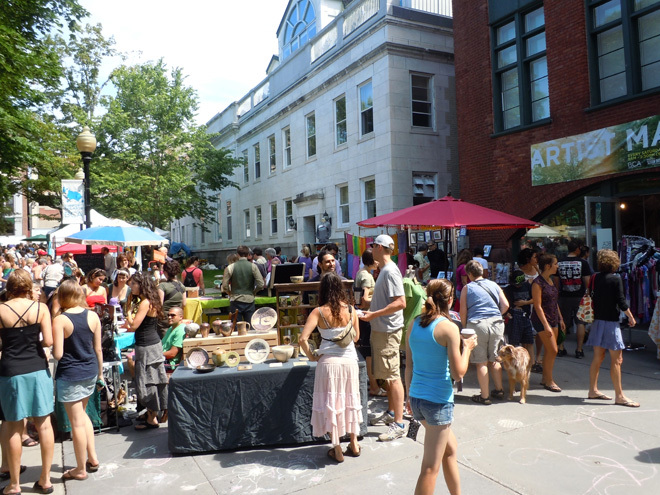 In front of the tiny alley, between the neoclassical town hall and Firehouse Gallery, you’ll find perhaps the most intriguing, albeit non-edible, part of the hubbub—the Artists Market. 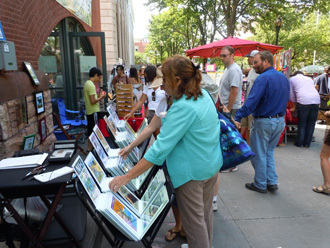 Opened in 2003 by Burlington City Arts Assistant Director, Sara Katz, in conjunction with center’s curation staff, the market sought a unique presentation of art. “We envisioned it as market that sold unique, one-of-a-kind works,” Katz explains, “and wanted it to feel distinct from other outdoor craft markets—to have more of a fine arts/design approach.” Today, there are thirty artists selling a large variety of work including pottery, paintings, graphic prints, digital drawings, silk screen inks, homemade fabric goods, jewelry, woodblock prints, henna tattoos, mixed media, origami accessories, automobile art, soap, and woodwork. 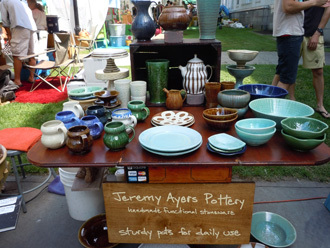 Jeremy Ayers has been selling his pottery there for since the beginning, happily spinning bowls, cups, and vases to the delight of passersby, especially children. “Pottery making is my very simple means to create some beauty in the world,” he explains while sitting amongst stacks of his creations, all of which strike a near perfect stance between aesthetic and functional. “I imagine all the pots I have made waiting on the shelf to be used. I hope for each one to be someone's favorite mug or bowl—the one you always reach for.” Like the rest of his peers, he loves the instant access the market provides to thousands of people, many of whom have become his customers. Prices range from $20-$100. Moe O’Hara approaches art a bit differently. Rather than create something from scratch, she repurposes everyday objects of twentieth-century lore into a new, functional medium. 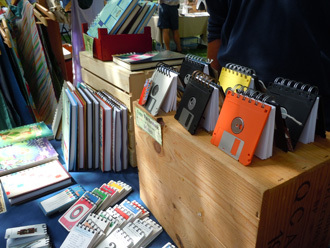 Floppy discs become notepad covers. Cassettes are woven into wallets, children’s book illustrations transform into magnets, buttons, and light switch plates. Game boards cover day planners. Maps and sheet music are folded into envelopes. It’s a technique that engenders endless “wows” and “cools” from the steady stream of customers. There doesn’t seem to be any shortage of material either. “I make my weekly or daily rounds at thrift stores,” she reveals. “Many of my customers want to help me out, so they will bring me supplies too.” Like so many of the other artists, she applied for a space in the artists market to develop her business in product, but she also relishes the opportunity to interact with the customers. “I think that the customers really like to meet the artist and hear their stories.” O’Hara’s works range $1–$30 and can be found throughout Vermont and Massachusetts gift shops as well as Etsy, the eBay for artists. 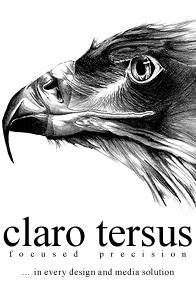 Nearby, Jousie Sourdiffe works in ink, or “feisty ink” as she prefers to call it. Her goal is to create wearable art, whether it be woodblock-printed shirts, hand-printed silk screens, or resin jewelry. “I have always loved printmaking as well as fashion so it made sense to combine the two.” For an even deeper appreciation, she’ll design your tattoo. This is her first year of being involved in the market and like most, loves it. “It has been a wonderful experience. “It has been great to be able to talk with my customers, to see what kinds of people are drawn to my work.” Prices range $15–$70. These are just three of the thirty artists out there each Saturday transforming their passions into something beautiful. No doubt the inspiration inevitably passes on to its customers, who then spread throughout the community as a whole, further enriching it. Art, perhaps more than any other measurement, illustrates the cultural health of a community and Burlington, Vermont enjoys an impressive surplus, a welcome balm in these troubled economic times. It also helps account for city’s sterling scores in nearly every report on quality of life. If there is any lesson it’s that buying local art is not a flippant, charitable, disposal of income, but a fundamental way to bring light to your community. The market runs through October 22, 2011, 9AM–2:30PM, weather permitting.